Windows 10 has the highest graphics requirement of any operating system to date, with 32% more graphics consumption than Windows 7. To take full advantage of the Windows 10 platform capabilities, enterprises need both high performance compute and GPU accelerated graphics. NVIDIA GRID GPU software provides an average 34% increase in the Windows 10 user experience (UX) quality. 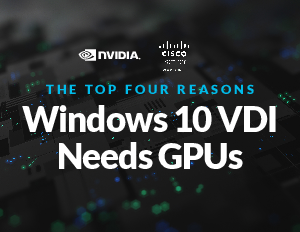 Download our eBook to read all about the 4 ways that GPUs will improve your Windows 10 deployments.